Originally from Saint Louis, Missouri, and the oldest of five children, Michael J. Blassie attended St. Louis University High School, where he earned a music scholarship for playing the bassoon. He chose to attend the United States Air Force Academy in 1966,. While at the Academy, Blassie lettered two and three years respectively, on the varsity tennis and soccer teams. He was named to the All-Rocky Mountain League Soccer Team in 1968 and 1969. He participated in the psychology majors program, and graduated from the Academy in 1970. He trained as a pilot at Columbus AFB, Mississippi, he then served as a member of the 8th Special Operations Squadron of the 377th Air Base Wing, and was sent to Bien Hoa Air Base near Saigon, South Vietnam in January 1972. On April 13th, 1972, during the Easter offensive by the Viet Cong, communist troops laid siege to the Song Be provincial capital of An Loc, and its population of 20,000. At dawn the North Vietnamese and V.C. infantries attacked with support from Soviet-made T-54 and PT-76 tanks as well as American-made M-41 captured during Operation Lam Son 719. North Vietnamese tank crews, fresh from training in the Soviet Union, rolling into the streets of An Loc without their infantry escorts were destroyed amid the confusion by M-72 LAW rockets deployed by ARVN (Army of South Vietnam) infantry. On May 11, 1972 Air Force 1st Lieutenant Michael "Blaze" Blassie was on his 138th combat mission, piloting his A-37B Dragonfly, serial number 69-6345 and callsign "Hawk Two", aircraft in the vicinity of An Loc, in South Vietnam. He was wingman for Major James Connally, the flight commander, flying support for an ARVN ground unit. Major Connally had gone in, successfully dropped his bomb load, and Lieutenant Blassie was in at low altitude to do a napalm drop when Connally saw fuel streaming from Blassie's aircraft. "Hawk Two Has Been Hit!" At the same time, Bob Goree, a Forward Air Controller in a OV-2 (callsign: "Sundog 21"), watched helplessly as ground fire from 23mm anti-aircraft fire struck Blassie's plane during an attacking run on enemy positions. Blassie's A-37B rolled, turned upside down, crashed and exploded. Returning to base, Connally reported having seen no sign of ejection from the plane. No parachute had been witnessed, and no emergency radio signals had been broadcast. 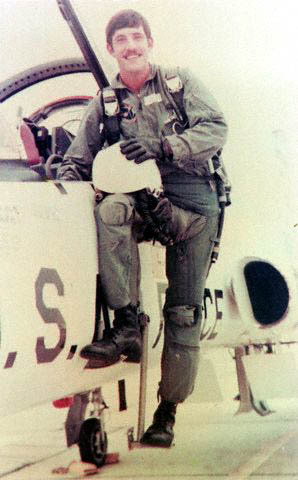 The day after the shoot-down, 1st Lt. Thomas “Doc” Waskow, an academy classmate of Blassie’s, hedgehopped over the A-37's crash site, peering down from his O-2 Skymaster and scanning the jungle for signs of life. But he saw nothing. For the next month, he monitored the “guard” band, the emergency channel, on his aircraft radio. But he heard nothing. Several of the recovered personal effects associated with "X-26"
Immediate recovery attempts were launched, but Lieutenant Blassie had crashed in an area heavily controlled by enemy forces and it was impossible to examine the crash site. With eyewitness accounts of the crash and explosion, and with no evidence that Lieutenant Blassie had survived, he was classed as "Killed In Action, Body Not Recovered", and his family back home was notified of the tragic loss. The North Vietnamese, unable to take An Loc, suffered heavy casualties when ARVN troops encircled and destroyed their positions. By July 20, 1972, the South Vietnamese forces were victorious. Lieutenant Michael Blassie was awarded a posthumous Purple Heart Medal, which was added to his Silver Star, Distinguished Flying Cross, and Air Medal with four Oak Leaf Clusters. Also, a building at Columbus AFB was named "Blassie Hall" in his honor. Five months after the crash, at the end of October of 1972, a South Vietnamese patrol reached the crash site. 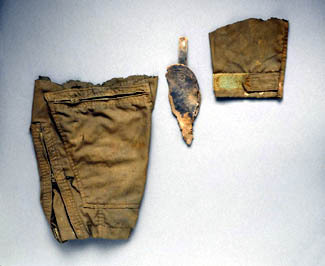 There, they located and recovered four ribs, the right humerus and part of the pelvis, as well as a collection of personal items, including Lieutenant Blassie's identification card, remnants of a flight suit, life raft, and part of an USAF holster. 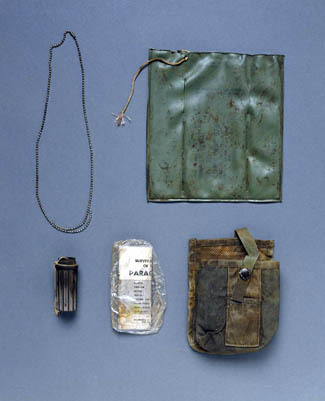 The remains and the associated items were turned over to the U.S. Army Central Identification Laboratory, Hawaii (CIHLI) for possible identification. But in the process, the identifying documents - namely the ID card - disappeared enroute. The bones were confirmed to be of a Caucasian who was similar in height and weight to Lieutenant Blassie, and were originally marked "BTB (Believe To Be) Lt. Blassie". Other aircraft had gone down in the vicinity on or near the May 11th date of Lieutenant Blassie's crash however, and conflicting evidence indicated that the remains recovered might be those of another lost airman. 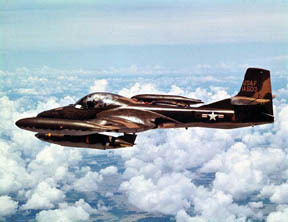 Ultimately the 6 bones recovered in October 1972 were designated "Unknown" and marked "X-26". For many years following Blassie's death, his remains were unidentified. "X-26" was designated the "Unknown" service member from the Vietnam War by Medal of Honor recipient U.S. Marine Corps Sergeant Major Allan J. Kellogg Jr. during a ceremony at Pearl Harbor, Hawaii, on May 17, 1984. The "Unknown" was then transported aboard the USS Brewton to Naval Air Station Alameda, in California. The remains were sent to Travis Air Force Base, California on May 24, and sent to Andrews Air Force Base, Maryland, arriving the following day. 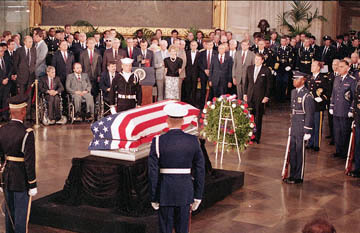 Many Vietnam veterans and President and Mrs. Ronald Reagan visited the "Unknown" as he lay in state in the U.S. Capitol. An Army caisson carried him from the Capitol to the Memorial Amphitheater at Arlington National Cemetery on Memorial Day, May 28, 1984. President Reagan presided over the funeral, and presented the Medal of Honor to the Vietnam "Unknown". The President also acted as next of kin by accepting the interment flag at the end of the ceremony. DNA identification had yet to advance to its current state when the remains were repatriated, and they laid in the Tomb of the Unknowns up to 1998, with visitors paying respects but unaware of their identity. Ted Sampley, a publisher and Vietnam veteran who served at Fort Bragg for five years in the late 1960s and early 1970s, repeatedly urged the Pentagon to exhume the remains. In 1994, he found evidence that the remains buried in Arlington National Cemetery belonged to Blassie. After Blassie's family secured permission, the remains of Blassie were exhumed on May 14, 1998. Based on mitochondrial DNA testing, scientists at the U.S. Army Central Identification Laboratory, Hawaii (CIHLI) were finally able to identify "X-26" as the remains of Lieutenant Blassie. On June 30, 1998, the Defense Department announced that the Vietnam Unknown had been identified. Blassie's remains was returned to his family, and an MC-130E aircraft from his unit, the 8th Special Operations Squadron, flew his remains back home to Missouri on July 10th, 1998. He was then reinterred at Jefferson Barracks National Cemetery. Following the removal of Blassie's remains from the Tomb of the Unknowns, the marble marker at Arlington was replaced with one that read, "Honoring and Keeping Faith with America's Missing Servicemen." Advances in technology, such as those that allowed the identification of Lt. Blassie, may lead to the eventual identification of all interments deemed "unknown" from Vietnam. Blassie's family also requested to retain the awarded Medal of Honor, which was denied. Undersecretary of Defense Rudy de Leon said, "the Pentagon had decided that the medal had been a symbolic award to all service members who lost their lives in the conflict and not to any individual service member." Ms. Lou Adams Pennebaker - who met Lieutenant Blassie while she attended college at the Mississippi University for Women in Columbus, Mississippi, and was engaged to him - established the Memory Tree Foundation in Meridian, Mississippi, dedicated to his memory, and with the purpose of encouraging and preserving the memories of those who have served or now serve in the United States Armed Forces from the American Revolution to the present.